The Flash Season 5 Episode 12 Recap: "Memorabilia"
“All you do is, you transmit your brain waves into Grace’s memories, right? 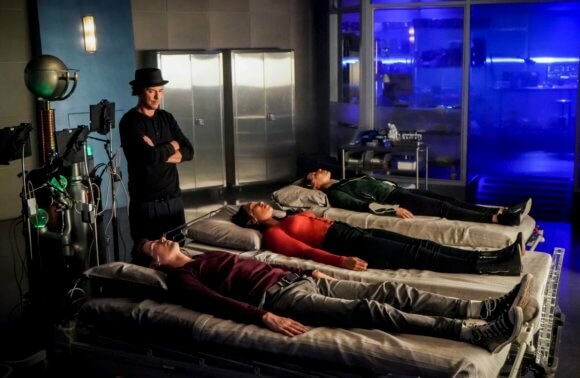 And then you lead her consciousness out of a nexus portal and Grace awakens,” says Sherloque (Tom Cavanagh) to Barry and the rest of Team Flash as Barry gets ready to try to bring Grace out of her coma to get Cicada to stop killing metas in season five episode 12 of The CW’s The Flash. As episode 12 begins, Nora (Jessica Parker Kennedy) is making another entry in her journal for Gideon to send to Thawne. She’s not sure how much longer she can keep secrets from her family and she notes how it feels as though she’s hurting them. The next scene is with Team Flash out on ice skating rink having fun. Barry (Grant Gustin) races an unsteady Nora around the rink and Ralph (Hartley Sawyer) tries not to fall as he attempts to stay with Caitlin (Danielle Panabaker). Meanwhile, Sherloque is skating rings around them all. (It’s great when they have these short little fun outings with Team Flash to keep the show from getting too serious). Back at S.T.A.R. Labs, Sherloque receives a memory machine from his Earth. It’s the device he used to catch the Mad Hatter and should let someone from Team Flash venture into Grace’s mind and, hopefully, bring her out of her coma. Sherloque informs Barry it needs to be two people together to watch out for each other. And, he tells them about the two drawbacks to his machine. The first is that it’s possible to get trapped in the mind of the person you’re entering. The second drawback is that the machine will sometimes give the passengers access to each other’s minds. Sherloque suggests the two speedsters team up and go in. Barry is fine with that but Nora looks sick about that suggestion. Nora’s afraid Barry might see her memories and find out her big secret that Eobard Thawne is her mentor! Ralph asks Cisco (Carlos Valdes) to help him talk to an informant he doesn’t trust. The informant might know where Cicada is held up, so Cisco reluctantly agrees even though he wants to get back to working on the meta cure. Nora talks to Gideon to see if there’s anything she can do to make sure Barry doesn’t see her memories. Gideon claims there isn’t. Nora then notices Sherloque has activated the tech on Grace’s EEG so she decides to go into Grace’s memories alone and bring her out solo. Nora goes in and finds herself in a memory of when Grace was at the CCPD after her parents died. Nora talks to Grace and tries to convince her to come with her and that she’ll take her to a place she will feel better. Grace finally agrees and as they head to the portal to leave it closes trapping Nora in Grace’s memories. Back at S.T.A.R. Labs, Sherloque realizes what Nora has done and calls Barry and Iris who come right away. Caitlin prepares them to go in after Nora. However, Barry and Iris end up going into Nora’s memories – not Grace’s. Nora’s in Grace’s mind and asks to be taken to a different memory. Grace takes her to her uncle’s home where he’s making pancakes for breakfast. Orlin (pre-Cicada) acts uncharacteristically happy and positive in Grace’s memory. On a different side of the city, Ralph and Cisco are at a bar talking to Ralph’s source who it turns out doesn’t know anything about the meta-killing Cicada but only about Sicada, the local bad rock group. 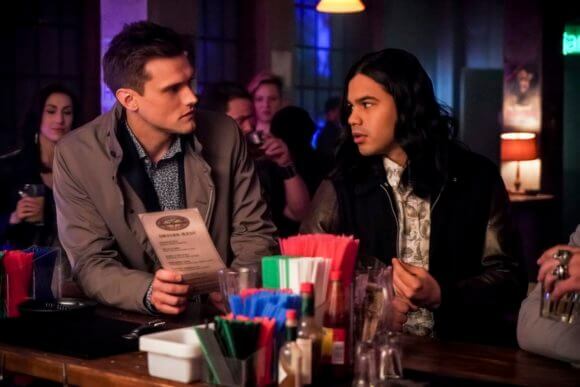 Ralph tells Cisco he’ll buy him a drink and Cisco realizes Ralph set him up to have a guy’s night out. He gets mad and tells Ralph he’s being selfish. Barry and Iris look around Nora’s memories, searching for the portal to get out. They come across The Flash museum of the future in Nora’s mind and Barry’s impressed and flattered by all the memorabilia – action figures, posters, keychains, hats, T-shirts, comics, and, of course, commemorative copies of the newspaper with the front page story “Flash Missing.” Sherloque and Caitlin are monitoring Barry, Iris, and Nora and realize Barry and Iris are in Nora’s memories and not in Grace’s. In Grace’s memories, she’s enjoying breakfast with Orlin. Nora quietly watches but soon realizes the place the portal might be is Grace’s last memory. She asks Grace to take her to the memory of the fair. Barry and Iris find a Hall of Villains in Nora’s memory and Barry gets upset that his enemies have their own wing in his museum. As they walk through, they discover that Cicada never gets caught and his body count is up to 152 in the year 2024. If that wasn’t bad enough, Iris and Barry witness a painful memory of Iris finding young Nora at the museum and being furious at her for not saying where she was going. Iris is shocked and upset watching her future self break Nora’s The Flash action figure while yelling at her that they’ll never visit the museum again. Barry tries to tell Iris it’s not really her and if she doesn’t want that to be a memory for Nora, she can change it. Iris truly wants to believe that but is scared because she tried earlier to get the newspaper set up and the only title she could legally use is the “Central City Citizen” – the same paper that has that haunting headline about The Flash vanishing. Iris tells Barry she hoped if she could at least change the title of the paper maybe that would be enough to change the future. Unfortunately, she thinks the future is already set. Grace takes Nora to her last memory, but it’s not the fair. Instead, it’s when Orlin is at her bedside and he becomes Cicada, swearing to kill all the metas. Apparently, Grace can hear what’s happening around her in her coma. Grace reveals she knows Nora is a meta and her uncle, who loves her, hates all metas. Over at the biker bar, Ralph confesses to Cisco that all he wanted was to have a night out with a friend. Ralph leaves to get Cisco an Uber ride after apologizing. While Ralph’s gone a cute bartender starts to flirt with Cisco, giving him a drink on the house. In Nora’s memories the suit of the Reverse Flash has come alive and is looking for Barry and Iris. The suit’s Nora’s defense mechanism and it has come alive because Nora is fearful in Grace’s mind. This is because Grace sends her defense mechanism after Nora – a blonde-haired Cicada. So, Nora’s running from the blonde Cicada and Barry and Iris are avoiding the Reverse Flash suit. Caitlin uses her device to talk to Killer Frost to connect with Barry and Iris. She then patches in Nora as well. Caitlin tells them the portals to get out are hidden in false memories. Barry realizes the false memory was the Hall of Villains where Iris was horrid to young Nora. They return toit and witness the real memory – that Iris was loving and comforting to a very upset little Nora who dropped her toy figure and broke it. The Reverse Flash suit shows up and Barry and Iris tag team it. The portal opens and Barry and Iris go through. Blonde Cicada has corned Nora in the false memory of Orlin making pancakes for Grace and is going to stab Nora with the dagger when Barry comes out of the portal into Grace’s mind. He slams blonde Cicada into the wall. He grabs Nora and they go through the other portal with Iris. Caitlin informs Team Flash that Grace has a piece of shard from the satellite in her brain. The doctors left it in, worried it would kill her if they removed it. The energy from the shrapnel is protecting her from them entering her mind again. Nora draws the inside of Orlin’s home so that Team Flash will have a layout of it. Barry asks Nora why she went in early and she makes up the excuse that she thought she could handle it. Sherloque suggests it was also so she could keep her secret. Everyone looks at Nora with a question on their faces and Nora, wide-eyed, is let off the hook by Sherloque who says Nora didn’t want Iris to see all the sad memories she had of her mother. Nora quickly agrees and walks off with Iris. Sherloque asks Barry what form Nora’s defense mechanism took and Barry reveals it was the Reverse Flash. Iris shows Nora and Barry an image that indicates she will start her newspaper. Barry’s thrilled for Iris but has to leave to find Cisco. Nora apologizes to Iris for all the incorrect memories and for not giving her a chance earlier when she first introduced herself to them. Barry finds Cisco showing off the cute bartender’s number to Ralph and asks him if he’s close to making a meta cure. Cisco claims h is and Barry reveals he wants to use it on Cicada. Nora enters another journal log to Thawne. She’s decided she’ll do whatever it takes to protect her parents, even if it means lying to them. Repetitive, unoriginal, and uneventful, season five episode 12 titled “Memorabilia” basically does a mind/memory enter storyline and chase similar but nowhere as interesting or thrilling as the series did in last season’s finale when Barry entered DeVoe’s mind to save Ralph and to stop The Enlightenment. One of the few flaws of season five is the use (and now overuse) of scenes, images, and ideas that are basically reruns of ones originally used in an earlier season. It’s great that The Flash has made it past it’s 100th episode, but the series needs to stop copying and repeating itself and move forward with new challenges, original ideas, and thrilling new fight and action scenes. It also doesn’t help the show that in this episode nothing gets resolved or unveiled. They go round and round only to end up exactly where they were before entering Grace’s mind. Nora still has her big secret and Grace is still in a coma. Nothing was accomplished. The whole episode was pointless. With Cisco close to a meta cure and Barry wanting to use it on Cicada, it should be interesting to see how Team Flash feels about forcing a cure on a meta.